Comece a ler The Walking Dead Vol. 27 no seu Kindle em menos de um minuto. 4,0 de 5 estrelasCan't Wait for the Next Volume! This volume was pretty fantastic. 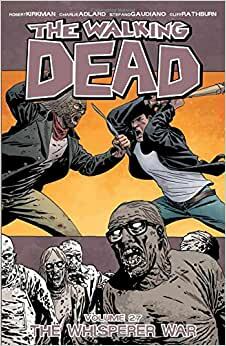 With the intense leave-off of the previous volume (Negan's escape, his assault on the Whisperers, the Whisperers assault on the survivors, and all that fun stuff), this volume really brings in some slaughter and redemption. As the title implies, Rick's people are officially at war with the Whisperers, thanks to Negan taking out their leader in search of trust and redemption from Rick. When Rick calls for aid from the Sanctuary and the Kingdom, they are reluctant to help. The Sanctuary's actions against Alexandria's informer may cause another war before the Whisperer war is even over. The Kingdom eventually comes to the aid of the Hilltop, but they are a bit late. Meanwhile, Dwight and Michonne take up the front lines to slaughter walkers and Whisperers alike. Happy with the final result, they tell Rick of their victory. When Dwight mentioned they took out hundreds, maybe even a thousand, Rick rallies the troops, because they did not face the ocean of walkers Rick had previously foretold them of. The herd is on its way to Alexandria, leaving us itching for the next volume to see who lives, who dies, and what will become of the ocean of walkers. This volume was interesting, exciting, and engaging from cover to cover. Not only do we see the conflict between the survivors and the Whisperers, but between the settlements of the living as well. We also get to see a different side of Negan and learn just a bit about Lucille--the REAL Lucille. 5,0 de 5 estrelasGreat Volume In This Series!! The Whisperer War is issues 157-162 of the popular The Walking Dead comics! With a herd of walkers descending on the group led by the Whisperer's, it's up to everyone to take out this threat once and for all. As Negan comes back to Rick with a surprise of his own, Rick is a leary of him but finds that he might be useful after all. With everyone fighting the herd and the Whisperer's, it takes a hidden surprise from the group to turn things in their favor with the most shocking and bloodiest war to date. They are left with the thought, did they kill all the Whisperers or is something more sinister coming in the future! Wow, Wow Wow is all I have to say about this volume of comics! This volume is so full of surprises that it's gonna make waiting until the next volume is release, kinda hard to do because you want to know what is gonna happen next for everyone, right now!! I truly believe that Negan is playing Rick but only time will for that and I so wish that everything that has played out in the comics so far, will find it's way to the show just to see it play out on screen!! Thank You to Robert Kirkman for making me want to read comics like this one that keep you coming back for more!! This book came from my own personal Library! Arrived home late from airport, found this on counter, tore open the package and stayed up past midnight reading. Well worth the lost sleep. Looking forward to next chapter and eventually finding out who/what is in OHIO! The novels just keep getting better, artistically and plot-wise. So much better than the show. I cannot help it... I love this graphic novel. Even if this one isn't the best one, it's still like getting a birthday present every time one comes out.